This is an even more advanced concept, initially proposed at the Scientific-Research Institute of Thermal Processes (now Keldysh Research Center), in Russia [Koroteev et al., 2002]. Studies started in 1954, and somewhat later also NASA-Lewis (now NASA-Glenn Research Center) began to investigate it as well. The original suggestion for gas-phase fission (as opposed to fission in solid materials) actually goes back to 1949 [Bussard and DeLauer, 1958, pp. 322-327], and was motivated by the need for a fast Mars mission (200 days, with no surface stay). For such a mission the Isp and thrust requirements were estimated in the range of 1,400 s and 105N, respectively. To make such a mission viable in terms of overall mass meant raising Isp without reducing the thrust needed for significant acceleration. At the time, increasing Isp was conceived possible only by raising the working fluid temperature, which is ultimately limited by the melting point of materials (electric thrusters had not been suggested yet). Hence a radical proposal, consisting of assuming that the fissioning fuel could not only be allowed to melt, but even gasify, so the heat release process could go on at much higher temperatures. Of course, to take advantage of this strategy the propellant too must be heated at higher temperature; so the real issue, and all its drawbacks, becomes how to transfer heat from the hot fissioning gas to the propellant. Gas-core temperatures planned were 20,000-50,000 K.
Two cycles ("open'' and "closed'') were invented to solve the heat transfer (HT) problem. Convective HT via a heat exchanger was and is out of the question, so radiative HT was the only alternative. In both cycles it was soon found that direct radiation HT from the fissioning fuel to hydrogen was unfeasible: in fact, at temperatures up to 10,000 K and pressures of the order of a few atmospheres, hydrogen ionizes less than 1%, and thus is optically thin. For this reason, radiative HT from the uranium plasma was planned as a two-stage process, by seeding hydrogen with carbon particles. Hydrogen plays the double role of propellant and of carrier gas. Fissioning fuel would heat carbon particles directly; in turn, the hot carbon particles would then heat the hydrogen carrier, to be expanded in a conventional nozzle. 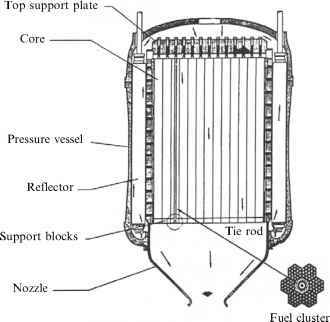 In the "open cycle'' solution, the fissioning gas is separated from the propellant by a cooler hydrogen layer (a similar solution was supposed to keep hot hydrogen from touching and destroying the vessel walls confining the reactor). A possible scheme is shown in Figure 7.24.